Queen Elizabeth II, the oldest British monarch, celebrates her 90th birthday later this month and, although we’ve run a piece on the Queen’s birth before, we thought it only fitting to take a second look at what proved to be a momentous birth. The then Princess Elizabeth (Elizabeth Alexandra Mary) was born at 17 Bruton Street in Mayfair – the London home of her maternal grandparents, the Earl and Countess of Strathmore (they also owned Glamis Castle in Scotland) – at 2.40am on 21st April, 1926. She was apparently delivered by Caesarian section and the Home Secretary, Sir William Joynson-Hicks, was in attendance to ensure everything was above board (the custom, which has since been dropped, was apparently adopted after what was known as the ‘Warming Pan Scandal’ when, following the birth of Prince James Francis Edward, son of King James II and Queen Mary of Modena, in June, 1688, rumours spread that the baby had been stillborn and replaced by an imposter brought into the chamber inside a warming pan). The first child of the Prince Albert, the Duke of York (Bertie) and Elizabeth Bowes-Lyon, the Duchess of York (later King George VI and Queen Elizabeth), she was third in line to the throne at her birth but thanks to the abdication of King Edward VIII, became her father’s heir. The event apparently drew a crowd to the property (although none could yet suspect how important this princess was to become) and among the well-wishers who visited the newborn that afternoon were her paternal grandparents, King George V and Queen Mary, who had apparently been woken at 4am to be informed of the birth of their second grandchild. The property was to be Princess Elizabeth’s home for the first few months of her life (named after her mother, paternal great-grandmother, Queen Alexandra, and paternal grandmother, Queen Mary, she was christened in the private chapel at Buckingham Palace five weeks after her birth). The home of her birth and a neighbouring townhouse have both since been demolished and replaced by an office building. 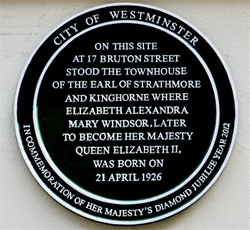 A plaque commemorating it as the Queen’s birthplace was installed in the Queen’s Silver Jubilee Year of 1977 and another to mark the Diamond Jubilee in 2012. The Queen’s birthday will be officially commemorated in June. Why was the home of the queen’s birth and a neighbouring town house demolished? If the building needed some work done on it, surely her maternal grandparents could have afforded the renovations? And why was it replaced by an office building? It was fashionable in the 1920’s and 1930’s to demolish “ugly” 18th century buildings that were the London Town Houses for the nobility. They needed the money as they were being taxed and the trend was to replace them with modern nnew build flats. Piccadilly was the home of a splendid 18th century house belonging to the Dukes of Devonshire – it was also demolished in the 1920’s. And the list goes on. Park Lane had lovely aristocratic house – only a few left. The Adelphi by Robert Adam was demolished in the 1930’s too. It even happened earlier, in the 19th century Victorian Era when many Classical 18th century buildings were demolished to build new roads and railways. There was no such thing as “Heritage”, listed or protected buildings or conservation areas in those days. Conservation as an idea in town planning didn’t really start until the late 1960’s in the UK. 1940’s bombing did the rest and many aristocratic buildings were damaged beyond repair. I’m sure it’s regretted now but at least these families have survived and restored their country estates.